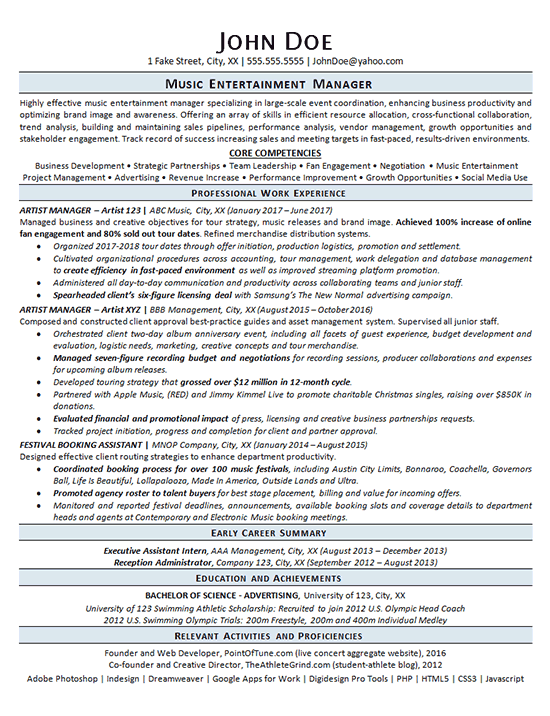 The entertainment resume was created for a client that has previously worked as a manager in the music industry. After bouncing around a few times in a short span, the job seeker is looking for something more stable that can be viewed as a long-term career. The goal was to highlight his strengths and potential contributions by explaining proficiencies in an introductory paragraph and listing their best qualities in a Core Competencies section. This was designed to focus solely on strong points, without addressing that they bounced around somewhat. From there, the three most recent employments were thoroughly explained, with the most relevant bullet points written in bold font so that truly stand out. The first two jobs were not directly related to the goal so they were listed in an Early Career Summary section. These jobs do offer some value, but bullet points were not needed. They were still included to show that the candidate has remained steadily employed. Next, the client’s education and achievements were listed before ending the resume with relevant activities and technology proficiencies. The overall picture of this client is portrayed as a well-rounded manager. Highly effective music entertainment manager specializing in large-scale event coordination, enhancing business productivity and optimizing brand image and awareness. Offering an array of skills in efficient resource allocation, cross-functional collaboration, trend analysis, building and maintaining sales pipelines, performance analysis, vendor management, growth opportunities and stakeholder engagement. Track record of success increasing sales and meeting targets in fast-paced, results-driven environments. Organized 2017-2018 tour dates through offer initiation, production logistics, promotion and settlement. Cultivated organizational procedures across accounting, tour management, work delegation and database management to create efficiency in fast-paced environment as well as improved streaming platform promotion. Administered all day-to-day communication and productivity across collaborating teams and junior staff. Spearheaded client’s six-figure licensing deal with advertising campaign. Orchestrated client two-day album anniversary event, including all facets of guest experience, budget development and evaluation, logistic needs, marketing, creative concepts and tour merchandise. Managed seven-figure recording budget and negotiations for recording sessions, producer collaborations and expenses for upcoming album releases. Developed touring strategy that grossed over $12 million in 12-month cycle. Partnered with major companies to promote charitable Christmas singles, raising over $850K in donations. Evaluated financial and promotional impact of press, licensing and creative business partnerships requests. Tracked project initiation, progress and completion for client and partner approval.